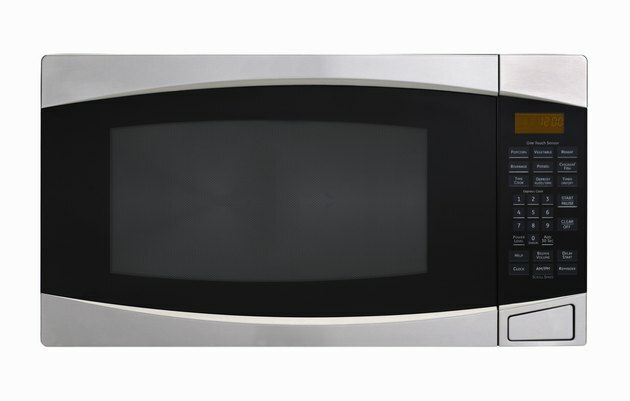 Microwave ovens offer speed and efficiency for heating food and water. Operating the device is fairly simple and often involves numeric touch pads or preprogrammed settings designed for specific food heating uses. The ovens usually provide reliable service if the operator uses a few simple precautions, including not operating the device while it is empty. Damage can result from operating an empty microwave oven. The energy emitted by the microwave magnetron causes water molecules to vibrate while heating the food. The microwave energy passes through materials such as glass, but metal reflects the energy, causing it to bounce around in the oven. Think of it as light bouncing around in a box where all the walls are mirrors. The water food absorbs the microwave energy, preventing it from bouncing off the metal sides of the microwave. Only water, or items containing water, such as food, absorbs the microwaves. Operating the microwave oven with only a glass plate, for example, is equivalent to operating the oven empty. The higher the water content in the food, the quicker it heats up in the microwave oven. Because the energy only acts on food, there is no need to preheat a microwave oven. As the microwave energy bounces around in the oven compartment, some energy bounces back to the magnetron, the component that generates the microwave energy, and causes damage. Damage to the magnetron renders the oven inoperable. Replacing the magnetron may cost more than replacing the oven. Placing metal objects without water in the microwave increases the risk of damage to the oven. Sparking occurs if small or bent metal is placed in the oven. For example, the twist-ties from a food package can lead to fires in the oven. Will Running an Empty Microwave Ruin It? Why Don't All Plant Cells Contain Chloroplasts? Is it Safe to Put Stainless Steel in a Microwave?